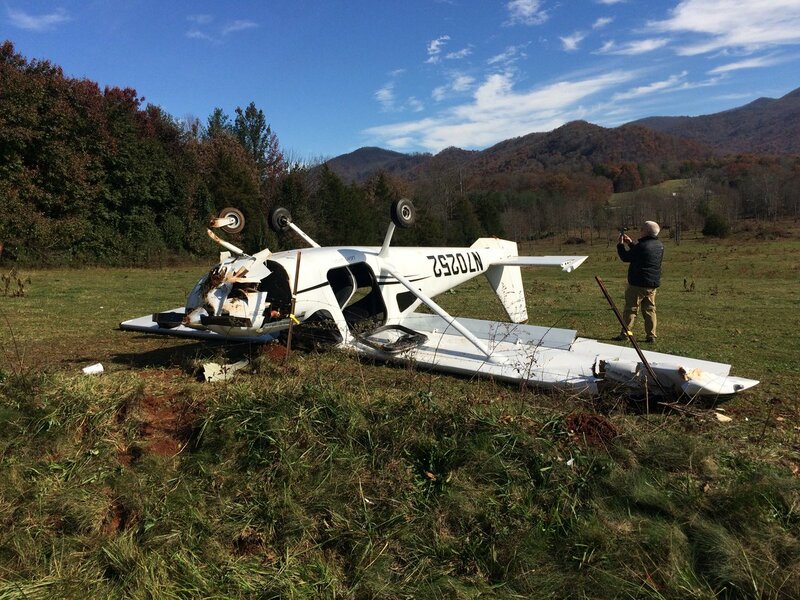 On November 16, 2018, about 1015 eastern standard time, a Cessna 162, N70252, operated by Lanier Flight Center, was substantially damaged during a forced landing to a field near Franklin, North Carolina. 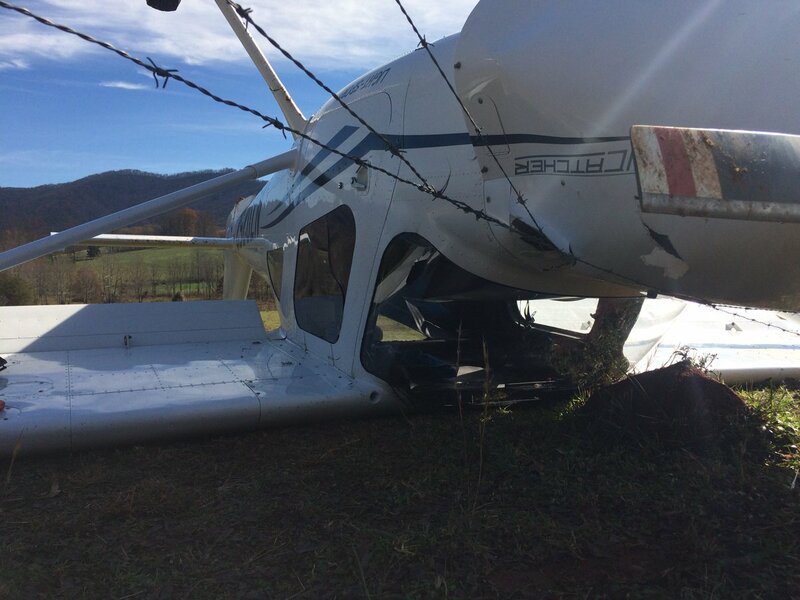 The sport pilot received minor injuries. The personal flight was conducted under the provisions of Title 14 Code of Federal Regulations Part 91. Visual meteorological conditions prevailed and no flight plan was filed for the flight that originated from Lee Gilmer Memorial Airport (GVL), Gainesville, Georgia, about 0900. 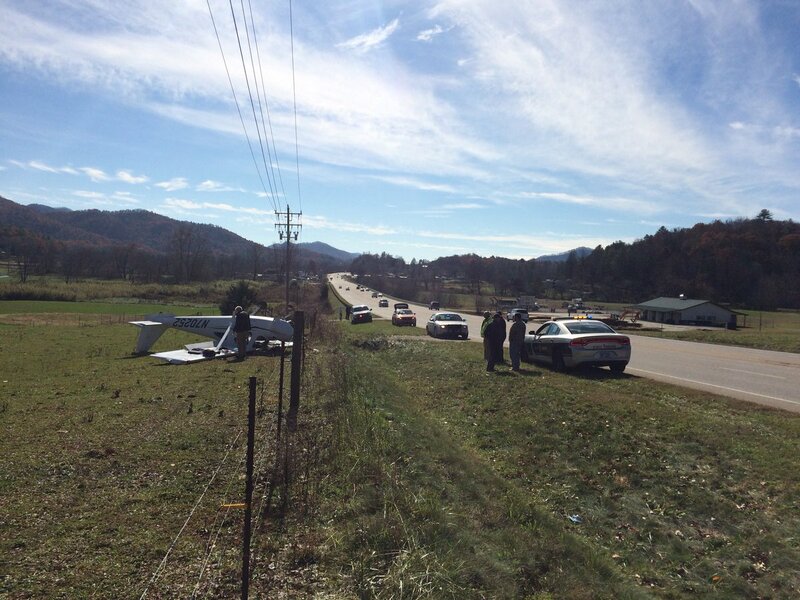 The flight was destined to Macon County Airport (1A5), Franklin, North Carolina. The sport pilot reported that near the destination airport, he reduced engine rpm from 2,350 to 2,200 and began a slow descent from cruise altitude of 3,500 ft mean sea level (msl) to traffic pattern altitude of 2,800 ft msl. The carburetor heat was not on at that time and about 2 minutes later, he became aware that the engine had lost all power without any roughness or sputtering. The sport pilot positioned the carburetor heat to on, mixture to full rich, and confirmed the fuel shut-off valve was not engaged; however, he was unable to restart the engine. During a forced landing to a field, the right wing struck a fence and the airplane came to rest inverted. The sport pilot further stated that after the accident, the operator inspected the airplane. Adequate fuel remained onboard and was absent of contamination. Additionally, no preimpact mechanical malfunctions were identified with the airframe or engine. The operator subsequently attempted a test-run of the engine on the airframe and the engine started and ran normally. The sport pilot added that he did not have a full understanding of the potentially subtle nature of carburetor ice. Examination of the wreckage by a Federal Aviation Administration (FAA) inspector revealed damage to the right wing and fuselage. The inspector confirmed that at his request, the operator completed a successful test-run of the engine on the airframe. The recorded weather at the destination airport, at 1020, included a temperature of 5° C and a dewpoint of 0° C. Review of an FAA carburetor icing chart for the given conditions revealed "Serious icing (cruise power)." Review of a pilot operating handbook for the make and model airplane revealed "…Descent…5. CARB HEAT Control Know – ON (as required)…." MACON COUNTY, N.C. (WLOS) — Macon County Emergency Services responded Friday morning to a plane crash on the east side of U.S. 441/Highway 23/Georgia Road, just south of the visitors' center. "Obviously there is still an investigation underway into what happened, but the initial report was that there was perhaps engine failure. The pilot was attempting to make an emergency landing and ended up crashing into the field here next to the highway," said Warren Cabe, Macon County EMS director. 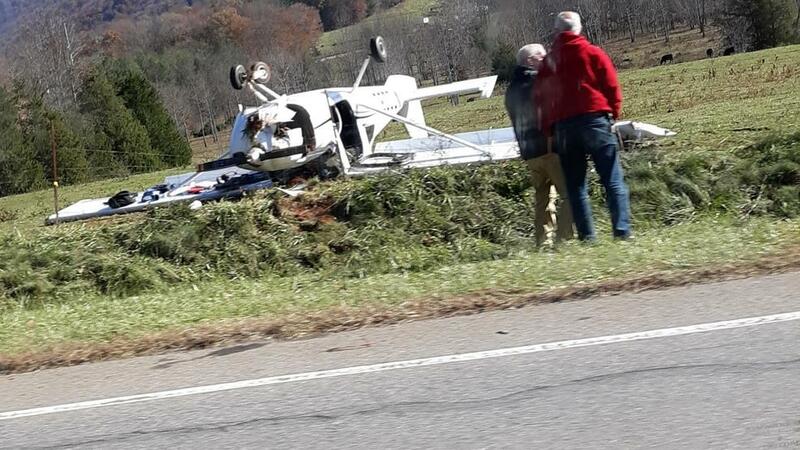 The plane went down around 10 a.m. and there were no serious injuries. Pilot Doug Finner tells News 13 that he was able to get himself out of the cockpit after the plane flipped during the emergency landing, saying the seatbelt worked, and he was able to walk away with just a few minor injuries. 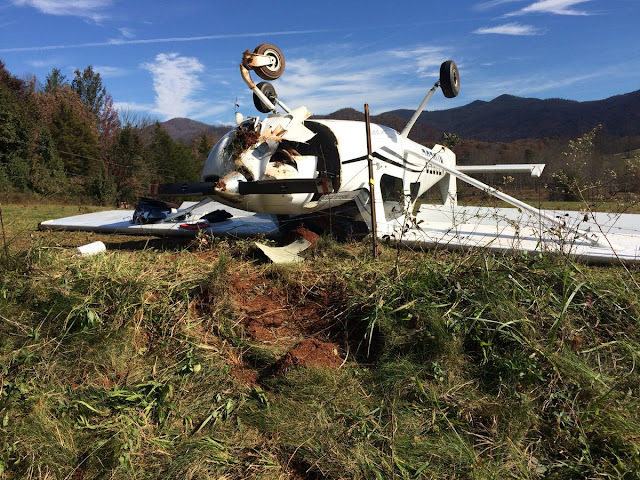 Finner says his single-engine rented Cessna Skycatcher, registered in Gainesville, Georgia, lost power to the engine, and he was forced to make an emergency landing in a cow pasture south of Franklin. Highway 23 can be busy at times and is a common route for large trucks. Finner said he the plane bounced over four or five lanes while, luckily, no one was driving by. He was trying to land in the field across the street, but, he says, when he realized the plane could clip a tree, he turned the plane and then bounced on one side of the road before the nose went into the embankment, on the other side, causing the plane to flip. Finner was able to free himself from the upside down cockpit and only suffered a few cuts. He left from Gainesville Georgia, destined for Macon County. He says he will soon head back to Georgia, and the plane will be towed. The plane was a rental which Finner said he had flown on and off for the last year. 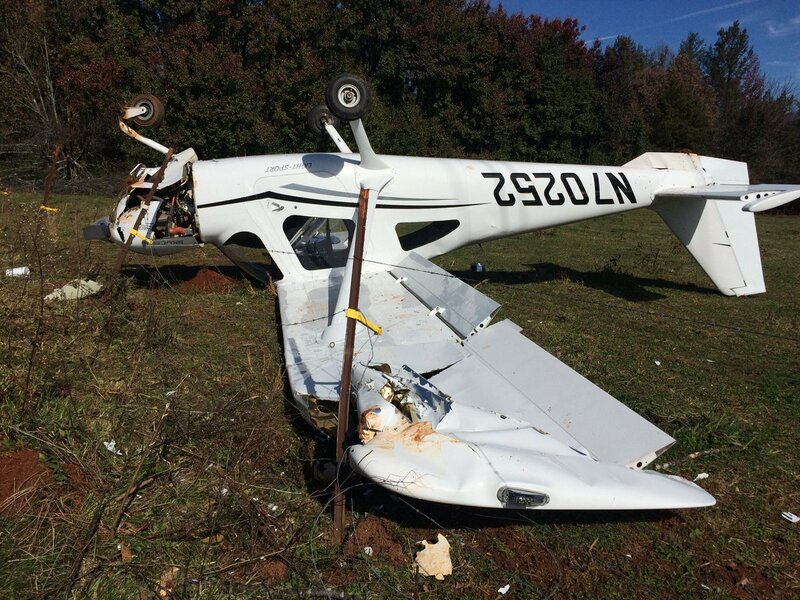 This would be the second Lanier Flight School aircraft to suffer an engine failure this year. I fly that plane every Sunday I just can't believe she stopped turning.